1 Secretary of State Condoleezza Rice, Special Briefing on the Travel to the Middle East and Europe of Secretary Condoleezza Rice (Press Conference, U.S. State Department, Washington, D.C., July 21, 2006). 2 Mark LeVine, “The New Creative Destruction,” Asia Times, August 22, 2006. 3 Andrej Kreutz, “The Geopolitics of post-Soviet Russia and the Middle East,” Arab Studies Quarterly (ASQ) (Washington, D.C.: Association of Arab-American University Graduates, January 2002). 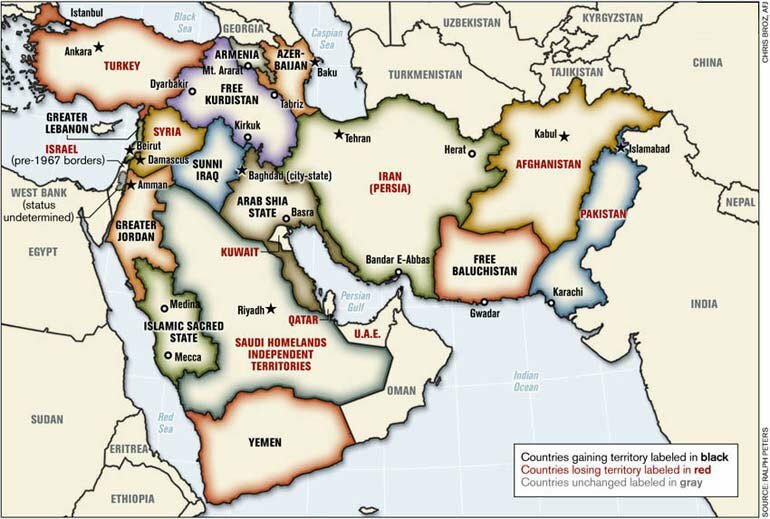 5 Ralph Peters, “Blood borders: How a better Middle East would look,” Armed Forces Journal (AFJ), June 2006. 7 Crispian Balmer, “French MPs back Armenia genocide bill, Turkey angry, Reuters, October 12, 2006; James McConalogue, “French against Turks: Talking about Armenian Genocide,” The Brussels Journal, October 10, 2006. 8 Suleyman Kurt, “Carved-up Map of Turkey at NATO Prompts U.S. Apology,” Zaman (Turkey), September 29, 2006.